Selenite is a hydrous calcium sulphate. Selenite is soft and can easily be scratched with a fingerna..
Selenite is a hydrous calcium sulfate. 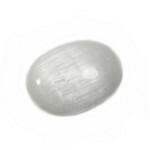 Selenite is soft and can easily be scratched with a fingernai..